Although Leonardo da Vinci is well known for his art, he was also a remarkable scientist. In fact, his 13,000 page notebook was full of inventions ranging from clocks to battle tanks that are still used today. Da Vinci was born on April 15, 1452 in a small Tuscan town called Vinci. Da Vinci’s mother was a 16-year-old, unmarried servant named Caterina. His father was a local notary named Ser Piero. After da Vinci was born, Caterina married a local cowherd and left the baby with Ser Piero, who gave him little attention. Da Vinci’s grandparents and uncle Francesco ultimately helped raise him. As an adolescent, da Vinci developed many skills including playing the lyre, singing, horseback riding, and solving math problems. He always carried a notebook to jot down sketches and ideas. When da Vinci’s grandfather died in 1468, his family moved to Florence, Italy. Ser Piero was well aware of da Vinci’s artistic abilities and sent him to the studio of Andrea Verrocchio. In the 1480’s, da Vinci’s art was recognized by Lorenzo the Magnificent. Soon after, he began working on The Adoration of the Magi. However, da Vinci abandoned his work to write to Ludovico Sforza, Duke of Milan, to whom he advertised his services not as a painter but as an engineer capable of making armored cars, siege engines, portable assault bridges, and catapults. 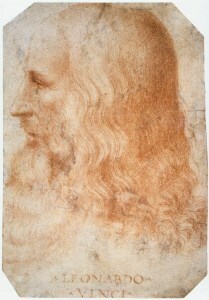 Before long, the Duke summoned da Vinci to Milan. While in Milan, da Vinci’s painted The Last Supper: this is considered one of his greatest achievements. He was also consumed by the project of creating a bronze statue of the Duke on horseback. Michelangelo, another world-class artist, mocked da Vinci for the statue. He and da Vinci then engaged in a ‘duel by paint’. Da Vinci painted The Battle of Anghiari while Michelangelo painted The Battle of Casciari, but neither of them finished their projects. Then, in 1499, the French captured Florence and the Duke fled. In the 1500’s, da Vinci was constantly on the move between Florence, Venice, Rome and other cities. He worked for Cesare Borgia and made maps of his lands. In 1503, da Vinci planned a route for a canal from Florence to the sea. He lost interest in painting The Battle of Anghiari in 1505 and instead worked on the Mona Lisa and started to write a book about flight. Two years later, da Vinci’s pocket notebook was filled with drawings and ideas for flying machines. When da Vinci turned 60, he took rooms in the Vatican in Rome and stayed there for three years. Then in 1516, he received an invitation form the French King Francois and left Italy forever. While in Cloux, France, da Vinci had a stroke that paralyzed his right hand. Most of his work after that was planning festivals and plays and making toys. He died on April 23, 1519 and was buried at St. Florentine, a nearby church. Da Vinci was a famous artist and scientist. He gave the world many masterpieces and ideas still valued today, centuries later. From displaying the layers of bodies by dissecting animals and humans and then painting them, to creating designs for flying machines like the ornithopter, da Vinci inspires many through his wide-ranging interests and talents.